MustLoveJapan presents "How to make Temakizushi (手巻き寿司). 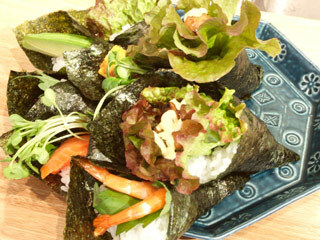 Temakizushi is family style sushi roll which you can make easily and cheaply. Temakizushi usually takes fishes as the ingredients and some salad. However, one of the exciting things about Temakizushi is you can add whatever kinds of your favorit foods. It doesn't have to be fish. For example, you can add steaks, burgers or pork. add salt (24g), suger(70g), rice vinegar (72 cc) and blend them. 2. put warm rice into box (could be bowl). Note: make sure rice is still warm. 4. add Sushi vinegar on the rice and mix them. Note: cool the rice down during mixing. 1. put nori on your hands and place sushi rice on just one side. Note: make sure you leave some space because you cannot roll with too much rice on nori. 3. put fishes, or fried eggs, or sea-chiken or any other ingredients. 4. then, roll. Note: roll from the buttom part. Make sure the sushi become cone shape. Note: you eat your sushi immediately after rolling. 1. put sushi rice over nori. Check out this MustLoveJapan Roll! It's so tasty. Find your original combo! Enjoy!